I am not a total unschooler, we tried it, we dabble in unschooling but it’s not what we do all the time. Every now and then there is structure because my kids and I just aren’t the unschool type. But this month, just for a change, we designated Project Based Unschooling Month. The kids would each have a project and they would work on it, nothing else required. So how did it go and what Unschool Projects did they pick? 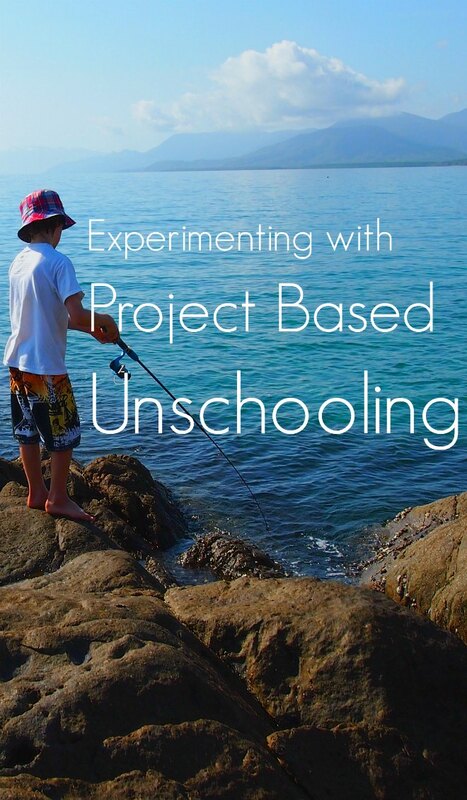 How Did the Project Based Unschooling Work? When I brought up the subject of project based unschooling I printed out some information on how this beast works, mostly to fire their imaginations but also to educate myself. They had project based unschooling ideas in front of them, things like learn as much of a new language as you can in a month, research black holes, build a rabbit hutch, take up a musical instrument, learn to fish and catch us a trout, write a book, draw a cartoon strip, take up photography and learn how to do it properly, paint a picture in oils, but they both went for projects that could make them some money, that’s kinda predictable with my two! They also both went for projects that mum knows a lot about, so that was helpful. I make a living from my websites and I’m proficient at Social Media promotion. What some see as a time waster is my job, so I was very keen for them to have a go and start their own income streams. I really didn’t want to help them too much, part of the skill set they’ll need in the world or in any business is the ability to find the right information and teach themselves new tricks. We set up a desk for child one, put his computer and books on it and said right, off you go! Child 2 lucked out on the desk front, he has to share the kitchen table with me, but one day we’ll fix that. Having his own desk and work station made a huge difference! He sits at that desk and goes for gold. This is something we’ve never seen with this child before, it’s been great for everyone to have a little more space. Project based unschooling or homeschooling, for Pinterest! How Has The Project Based Unschooling Worked Out? For my elder child it’s been fabulous. He’s enthusiastic, he wakes up in the mornings with new ideas to try, he’s been productive and the amount he’s learned has been phenomenal. He’s been shooting video with a couple of different cameras, adding animations, doing some stop-start stuff with Lego and people and he has his You Tube Channel ready to go. He’s had to figure things out like, what software he needs, how to convert file types, he’s sussed editing in Movie Maker and Paint.net, probably a whole heap of other things I don’t know about. His next job is to create, or buy, a logo and some art work before launch. What’s fabulous is I don’t know how he does it! The skills he’s acquired are totally new to me and his videos aren’t what I expected at all, they’re more creative. I can help him with the next stages of SEO , monetisation and marketing, but what he’s done so far has been independent of Mum. That’s a relief! I’ve been free to get on with my own work at last. For my younger child it’s been less productive, he started his social media accounts, took some photos to share, wrote a couple of blog posts then pretty much lost interest. He’s been more interested in watching what his brother is doing. Maybe it was the wrong project or maybe he’s just too young still. My husband has taken up the educational slack there, they’ve been learning Romanian together from easy Romanian kids picture books and are both doing great. This child is “ahead” of the school kids in terms of maths, science and English, so no worries that he’s not doing enough by conventional standards. He’s an easy homeschool student, he’ll sit and do written work and likes getting things finished, unlike his brother! They’ve also been out and about this month studying the world, ( worldschooling) we’ve had a good month for field trips with Romanian Orthodox Easter, a trip down a salt mine, Roman remains, WW1 European history and local spring festivals based on the agricultural calendar. They’ve also been watching an architect and a team of tradesmen building a house, helping out sometimes and socialising with Romanians, Australians, Brits, Canadians and Lithuanians. One of the above tried to teach them to wrestle, he was some sort of champion, but the idea wasn’t too popular with me! Still, they had fun. At the end of the month we head to Athens to indulge their passion for Greek mythology, Thank GOD for Rick Riordan’s ancient history and mythology based books, they read them constantly and beat me or any other adult on the Greeks, Romans, Norse Gods and Egyptians. My younger child has been crazy about cooking lately, he can now knock up pasta and sauces, Welsh Cakes, Apple cake, eggs any way you please and fabulous breakfast pancakes. This came about because I went on strike in a menopausal huff and left them to feed themselves, evil twisted mother that I am. It worked! He actually grabbed the cook books and off he went. So that’s how our homeschooling or unschooling month is going. I know I said I’m not an unschooler, but that’s exactly what we’ve done this month. How’s your month been? Have your kids come up with any great ideas for projects? My oldest is the same has his own YouTube channel and leanrt so much I can’t keep up (same age as your oldest).He taught himself to play the quitar in 3 months and practices everyday for hours (and never because we ask him too!). He loves animation and coding too. My boys also loves spending time together and don’t need constant playmates. We also love our own company as you mentioned in another post. So relate to the menopausal huff and getting fed up with the 3 meals a day ? We more unshcool then homeschool but also don’t go with labels myself. I came across your travel blog in hoeschool swap on fb as we were also looking for place near London. Good luck with finding a place! Hi Samantha, glad you found us and it’s good to connect! D is now in charge of all our video. I’m paying him 2 pounds per video he makes. OK, so that’s a lot compared to how much money I actually make on YouTube ( 5p so far!) but if it goes into his bank account it’ll eventually buy him the computer upgrade and video kit he needs. We’re going to upload the latest one this morning I hope.